The GST Regime mandates every person/business with an annual turnover of Rs. 40 lakhs* (Rs 10 lakhs for North Eastern states) or more, to register as a normal taxable person. Likewise, a person making inter-state transactions of taxable goods/services is also required to be registered under GST. In a similar manner, if a taxpayer is no more liable to pay tax, he can also chose to cancel his/her GST registration. However, if the GST registration of a taxpayer is cancelled by a proper officer, he can not procure taxable supply of goods and services without revocation. Nevertheless, for a person, who continues to trade taxable good/services without proper GST registration, it shall be treated as an offence under GST and is liable heavy penalties as found appropriate by the authorised officer. Liability: GST registration is mandatory for every business exceeding the threshold limit. However, if the annual turnover of the business drops below the given threshold limit, the registered person can opt in for GST cancellation. Merger: The taxpayer has transferred or merged the business with another organization or vice versa). In this case, the transferee (or the new company from amalgamation/ demerger) has to get registration under GST. Dissolution: The taxpayer has discontinued the business. For cancellation, the taxpayer will have to submit an E-application in FORM GST REG-29 through the GST Portal. An authorised officer, upon proper enquiry, shall provide cancellation of the registration. If in case, a registered person is deceased, the family or the legal heir of the taxpayer can apply for cancellation of GST registration in FORM GST REG 16. The registered person does not conduct business from the place as declared during registration. The registered person issues invoices without any supply of Goods and/or Services. For any disagreement, the registered person is required to reply in form REG -18 within 7 days of issuance of the notice. If the authorised officer finds the reply to be satisfactory, he can drop the proceedings and pass an order in FORM GST REG –20. In case of cancellation imposed by an authorised officer, the given taxpayer can apply revocation of cancellation within thirty days from the date of the cancellation order. 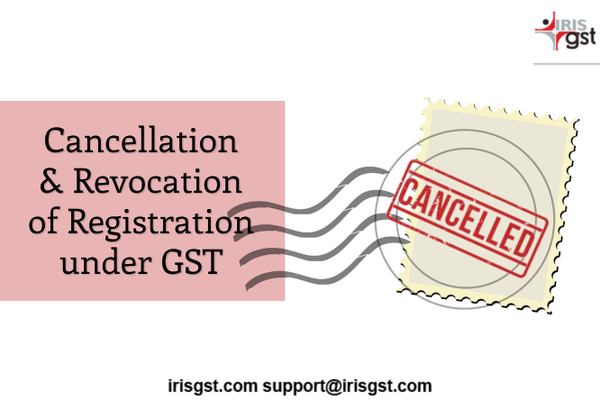 A registered person submits an application for revocation of cancellation through FORM GST REG-21 on the GST portal. Record the reasons for revocation of cancellation of registration in writing. Reverse the cancellation of registration. Pass an order of revocation in FORM GST REG-22. However, if the reason submitted by the taxpayer is not found satisfactory to the authorised officer, he can reject the application for revocation. The officer is required to order in FORM GST REG-05 and communicate the same to the applicant. Before rejecting, the proper officer must issue a show cause notice in FORM GST REG–23 for the applicant to show why the application should not be rejected. The applicant must reply in FORM GST REG-24 within 7 working days from the date of the service of the notice. The proper officer is required to take a decision within 30 days from the date of receipt of clarification from the applicant in FORM GST REG-24. If a taxpayer does not apply for revocation of cancellation, it shall be deemed to be a ‘deficiency’ within the meaning of rule 9 (2) of the Central Goods and Service Tax Rules, 2017 and can be considered as a ground for rejection of the application for fresh registration. As stated before, for any supplier of taxable goods and services, exceeding the given threshold limit, is required to register under GST. However, in recent times, GST officials have come across application of fresh registration of businesses, who have had their registration cancelled by an officer, on account of non-compliance of the statutory provisions. To avoid such circumstances, CBIC released Vide circular no. 95/14/2019-GST dated March 28th, 2019, wherein the officials have clarified the consequence the taxpayer has to face in case of non-revocation of cancelled registration. If the registration is cancelled, whether the taxpayer has opted/filed application for revocation of cancellation of registration. As per Vide circular no. 95/14/2019-GST dated March 28th, 2019, an authorised officer has been given the power by the CBIC to reject an application of fresh registration, if upon analysis, the applicant is found to have a registration cancelled by an officer, and the applicant has not filed for the revocation of the same. Note: Application for revocation cannot be filed if the registration has been cancelled because of the failure to file returns. Such returns must be furnished first, along with payment of all dues amounts of tax, interest & penalty. Anushree Joshi, a CA and CMA, is associated with IRIS as Business Analyst for over 7 years. She is actively involved in the IRIS GST product development and client interactions and issue handling . Before GST she was handling US compliance analyzing US financial statements and reviewing XBRL filings for US and India market. In her leisure time, she enjoys reading and put up her feet on the classical dance form of Kathak.